Directed send around three cones. Three cones are set up in a line. The dog is directed to circle each one in turn, returning directly to the handler after each repetition. Purpose: Demonstrate the ability to control the dog’s direction of travel. Exercise set-up: Four cones are arranged in the same manner as exercise 5-1. Handler starts at cone #1 (the single cone) with the dog in heel position. The exercise begins when the dog is sent to circle one of the other cones (cones can be circled in any order). The dog must go out and around the cone with a single verbal and/or signal cue and return within easy touching distance of the handler before setting up for the next cone. The dog must come in close enough to be touched by the handler, but no formal front or finish is required; the dog may be sent to the other cones without pausing. No additional recall cues for the return are permitted. The handler will then pivot to face the second cone and repeat and, finally, one last time with the third cone. The exercise ends after the dog returns to the handler after the final cone. The dog may be praised after each cone is completed once the dog has returned to the handler. 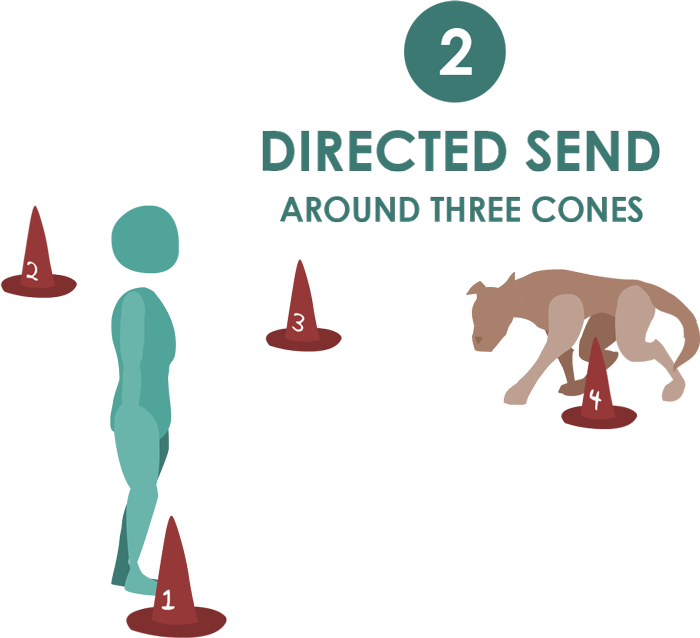 The handler and dog may pivot to face each cone before sending. Non-qualifiers: Dog requires more than one cue to go around a cone. Dog does not go around the correct cone as directed by the handler. Dog does not return directly to the handler after circling the cone. Video does not permit the exercise to be adequately judged.